Today, Ryan Seacrest launches his new tailored men’s clothing collection – Ryan Seacrest Distinction – exclusively at 150 Macy’s stores nationwide and on macys.com. The sophisticated line includes suit separates, shirts, ties and accessories – all designed to mix and match through the innovative Style Made SmartTM color matching system. Curated by Emmy Award-winning host and producer Ryan Seacrest, the collection fuses enduring traditional menswear designs with a contemporary, optimistic attitude. Steeped in the traditional menswear design tenets of quality and value, Ryan Seacrest Distinction is influenced by classic menswear and iconic looks. It incorporates clean lines, striking color stories, textural juxtapositions and bold styling to wardrobe today’s everyday man. Masculine signatures, geometric shapes, proportion, texture, pattern and color are combined with the finest materials. Ryan Seacrest Distinction was developed in partnership with Randa, Peerless and PVH to deliver a quality tailored clothing and accessories collection that is both accessible and affordable. Items retail for $69.50 for a shirt, $150 for a pant, $400 for a jacket, $59.50 for neckwear, and $29.50 to $59.50 for accessories. Ryan Seacrest Distinction features the Style Made Smart color matching system which allows customers to coordinate various shirts, ties, and jackets with ease, knowing each item will match and look great when paired together. Jackets, pants, shirts, and ties are labeled with numbers from four color groups (black, grey, blue or brown), making it easy to create a perfectly-coordinated look. Shirts and ties are designed to match with two or more of the color groups, generating many tasteful options. Seacrest will appear in a dedicated advertising campaign in celebration of the collection that will include outdoor, print, radio and digital as well as a television commercial that will premiere nationally on September 9. The TV spot, titled “Non-Stop,” features a behind-the-scenes look at the hectic pace of what happens behind the camera, when a knowledgeable associate transports a young man backstage for the ultimate makeover with Seacrest. Macy’s will celebrate the official launch of Ryan Seacrest Distinction with an event at its Herald Square flagship store in New York City. 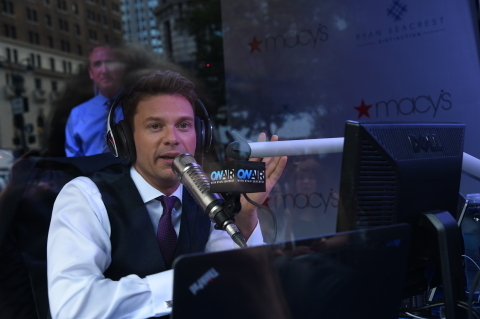 Seacrest holds preeminent positions in broadcast and cable television, nationally-syndicated radio and local radio. He is celebrated internationally as host of the top-rated, primetime talent showcase “American Idol” on Fox, and he is host of “On Air with Ryan Seacrest,” his market-topping No. 1 nationally-syndicated Los Angeles morning drive-time show for Clear Channel’s 102.7 KIIS-FM, as well as a nationally-syndicated Top 40 radio show. In 2006, Seacrest launched Ryan Seacrest Productions (RSP), which has since become an Emmy Award-winning entertainment production powerhouse creating unscripted, scripted and digital programming. As part of the Ryan Seacrest Distinction launch with Macy’s, he will host and executive produce “Fashion Rocks” on CBS. With this assignment, Seacrest becomes the first broadcaster to host shows on four major networks – ABC, CBS, NBC and Fox. Macy’s, the largest retail brand of Macy’s, Inc. (NYSE:M) , delivers fashion and affordable luxury to customers at approximately 800 locations in 45 states, the District of Columbia, Puerto Rico and Guam, as well as to customers in the U.S. and more than 100 international destinations through its leading online store at macys.com. Via its stores, e-commerce site, mobile and social platforms, Macy’s offers distinctive assortments including the most desired family of exclusive and fashion brands for him, her and home. Macy’s is known for such epic events as Macy’s 4th of July Fireworks(R) and the Macy’s Thanksgiving Day Parade(R), as well as spectacular fashion shows, culinary events, flower shows and celebrity appearances. Macy’s flagship stores – including Herald Square in New York City, Union Square in San Francisco, State Street in Chicago, Dadeland in Miami and South Coast Plaza in southern California – are known internationally and leading destinations for visitors. Building on a more than 150-year tradition, and with the collective support of customers and employees, Macy’s helps strengthen communities by supporting local and national charities giving more than $70 million each year to help make a difference in the lives of our customers.